Sam, Ali and Charlie all yell with delight, there’s a creepy sleepover at Frankie’s tonight! Press the buttons on the pages to hear this entertaining story read aloud, helping beginner readers learn to read themselves. 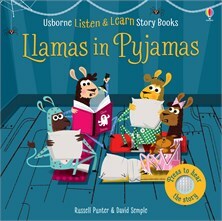 With simple rhyming text, colourful illustrations and parents’ notes on phonics at the back of the book.